Interior yacht design, yacht or home? Whether your yacht is a small, large, or even a super yacht, at some point you may wish to remodel its interior, just as you would a house or a flat. This can be a difficult task even on land. On the sea, the vast majority of the issues found on land can also be found on a yacht. Some of these can be exaggerated by the special circumstances found on a yacht and additionally, there are the special circumstances involved with a yacht. 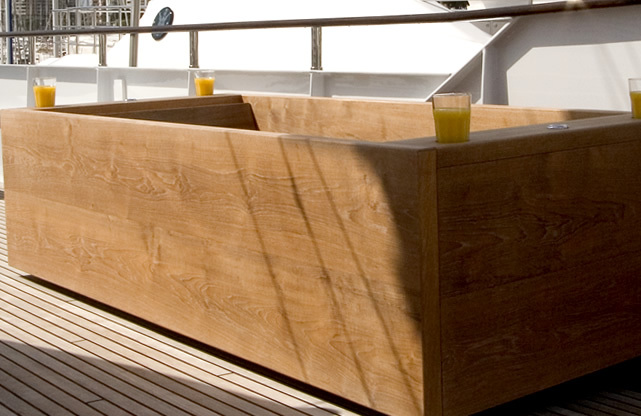 For these reasons, among others, interior yacht design is often more of a challenge. On a super yacht, a lot of these problems are lessened, as space problems tend to be of a degree similar to many flats or apartments and the effects of the sea are felt less on such a yacht. Whilst the size of super yachts makes them more stable than smaller yachts, since even large ocean liners aren’t immune to pitch and roll it is a good idea to consider the effects of the sea for times when you moor in a more exposed mariner, or are outside of one. Nevertheless, a super yacht is a lot easier to make feel like a home and be furnished as one, with concessions to the nautical setting being less severe and more subtle and the ability to use a wider range of none yacht-specific furniture and decorations. With a super yacht, therefore, there is a greater choice between whether you want to make your yacht feel more like a land based house, or go all out with making sure people don’t forget that they are on a yacht. On smaller yachts, your ability to go for a land based home feel gets diminished and the fact that you are on a yacht is not easily disguised. Thankfully, however, this does not mean that you can’t make it feel like a home, just that you have to be more sympathetic to your environment when working out your design. Work with the feel that the spaces give, turning any potential claustrophobic feel to the rooms into a cosy home feel and stylise the boat to help either celebrate the location, or to make it blend into another style. Be wary in such a space of trying to over dominate the boat’s natural features and nautical concessions, as this can make a room feel more claustrophobic. When looking at homely features to incorporate, there are considerations to be made. While some of these are obvious, things need to be more stable and slight more robust, others are more especially overlooked. Many things fade in direct light, especially direct sunlight, which, due to reflections from the water, is a bigger problem at sea than it is in most situations on land. Water is a clear danger and capable of doing plenty of damage, but it is the salt, especially that in the spray, that does most damage and can affect items you may think are safe.